Rice Fusion Sushi is an Asian fusion restaurant located in the Algonquin Commons shopping center along the Randall Road corridor. 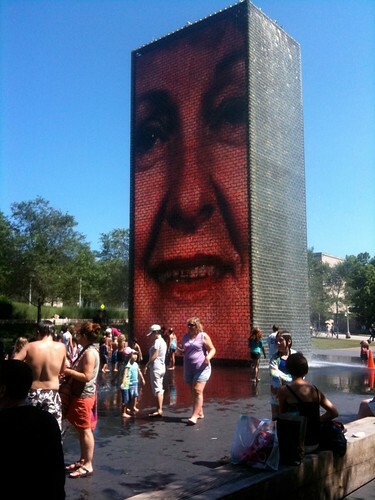 We stopped by for lunch on a recent Saturday afternoon. 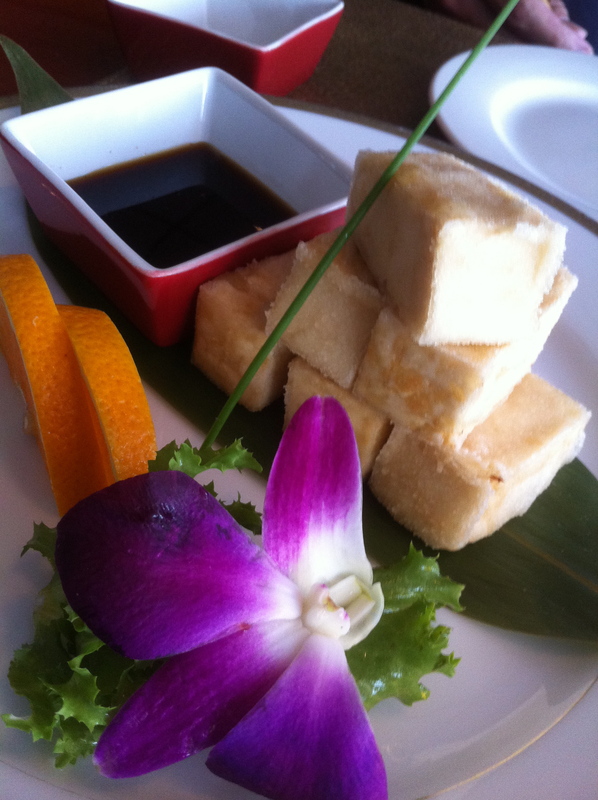 The menu includes fusion Chinese, Japanese and Thai specialties including many vegetarian items. They take special care to ensure all food is presented attractively. Our server was attentive and helped us choose our food. 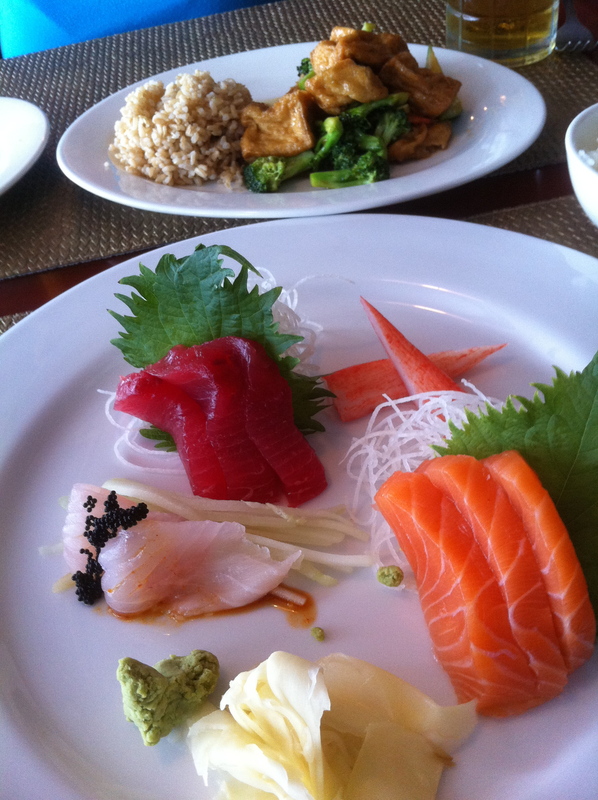 The sushi was fresh and we liked all the dished we sampled. 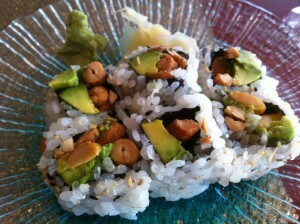 Our meal started with a peanut and avocado maki roll, an interesting mix of creamy and crunchy textures. Miso soup and salad with house ginger dressing made daily was served next. Stacked pieces of Agedashi Tofu sat on a banana leaf accompanied by an orange slice and orchid blossom. Noel had the sashimi lunch; eight pieces of fish including salmon, tuna, crab and fluke. This was served with a dollop of fine black masago. My Hibachi Tofu came with a choice of white or brown rice and soup or salad. Save room for dessert! We tried two items and they were both delicious. The chocolate caramel pyramid was cool and creamy as it melted in my mouth. 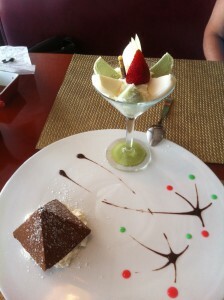 The green tea and vanilla mochi balls were layered with whipped cream in a martini glass. There are many items our server recommended that we plan to try on our next visit, including Thai Coconut Soup and Sweet Potato Roll. Choose from three maki rolls from a special menu for $12. Full bar service is includes a choice of Asian beers. The interior of the restaurant is red and black with a Chinese flavor. A smiling Buddha greats you as you enter the restaurant. For those who cannot make it to Rice, delivery is available. We thoroughly enjoyed our visit to Rice.